brother of boxer Max Baer. Cousin of "Little Don Guthridge," catcher Ray Mueller joined the Solons' roster in 1942. He was behind the plate in 164 games, driving in 102 runs, with 16 home runs and a .297 batting average before he was sold to Cincinnati the following year. 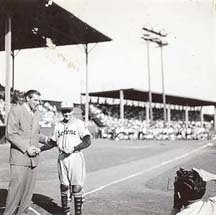 Mueller was named the Pacific Coast League's most valuable player of 1942, the year his team won the PCL pennant.